The Dow Jones Industrial Average (DJIA), sometimes referred to as simply the Dow, is one of several well-known stock market indices. The DJIA was created by Charles Dow, founder of the Wall Street Journal, to measure the daily stock price movements of 30 large, publicly-owned U.S. companies. The DJIA is the second-oldest U.S. market index, following the Dow Jones Transportation Average (DJTA), also created by Charles Dow. The Dow Jones Industrial Average was originally intended to measure the movements of companies within the heavy industry, like construction companies and businesses dealing with heavy products. 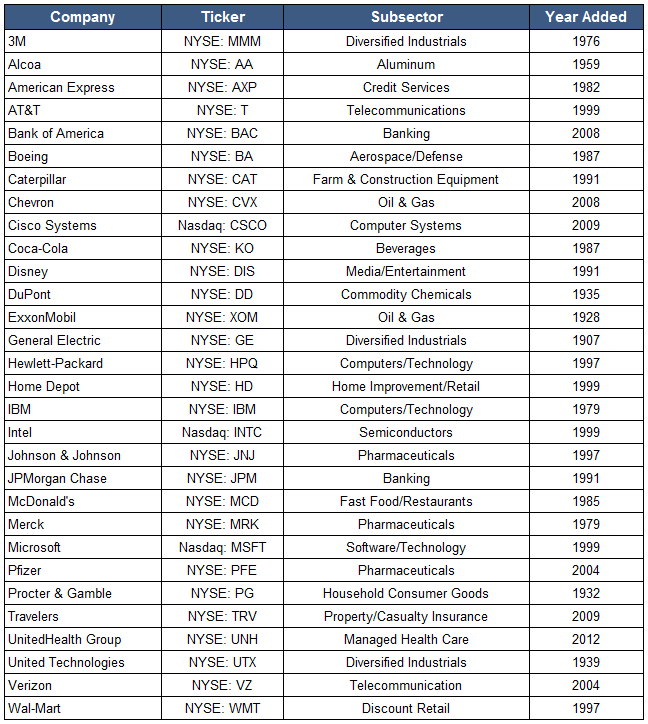 Today, however, that name is strictly historical; very few of the index's 30 companies have anything to do with industrial goods. The 30 blue-chip companies, considered to be the leaders of the economy, are chosen by the editors of the Wall Street Journal, a practice that dates back to its inception in 1896. The DJIA is price-weighted, meaning that the movement in stocks with higher prices impacts the Dow more than stocks with lower prices. The Dow's daily value is not the true average of the 30 stocks' prices, but is actually the sum of the prices divided by the Dow divisor, which is adjusted in cases of stock splits, spinoffs and other structural changes to keep the weighting constant and maintain continuity. The Dow is one of the most closely watched market benchmarks tracking stock market activity. Although it was created to track the performance of the U.S. industrial sector, it now is seen as a proxy for general market conditions. Although it is the most widely recognized of all the market indices, the Dow is sometimes criticized for not depicting an accurate picture of the entire market's performance (since its movements are based only on 30 companies). It is also criticized because as a price-weighted index (as opposed to market-weighted index) price changes in some world's largest companies, including General Electric, Microsoft and Pfizer, actually have a lower impact on the Dow's performance than smaller members that happen to trade at higher prices. What made you want to look up Dow Jones average? Please tell us where you read or heard it (including the quote, if possible).